MCI’s signature School2School Connectivity Project (S2S), a partnership with global communications giants Ericsson and Airtel Ghana, the City of Kumasi, Ghana, the Kumasi Metropolitan Education Directorate, Columbia University Teachers College and selected New York City public and private schools to teach the uses of the computer and the Internet in the teaching of the STEM subjects, recently entered its third and final year of programming, which will include the planning of joint projects undertaken by middle school science, math and technology classrooms in Kumasi and New York. On Saturday, October 13, S2S Project Manager Liz Kubis and Teachers College professor and S2S Assistant Director Ellen Meier hosted a lively and productive training for participating New York City schoolteachers. This daylong session focused on how to effectively introduce the Millennium Development Goals (MDGs), how to encourage community between the New York and Kumasi schools and how to create project-based, child-centered science- or math-focused lesson plans to be implemented both in New York and Kumasi. Teachers also had time to share insights and collaborate on lesson planning. 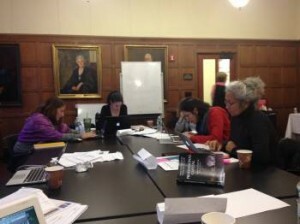 A training with New York City schoolteachers participating in the S2S Program. The S2S program this year will consist of at least four shared lessons between each New York City classroom and their partner classrooms in Kumasi. The introductory lesson will establish similarities between all students and open a dialogue between classes, with each class asked to give a presentation. The second lesson will be a joint math or science session, bridging what the students are learning in class and introducing concepts of sustainability. The third lesson will focus on introducing and making sense of the MDGs, and during the final lesson teachers will create collaborative science or math projects between partner classrooms that address one or more aspect of the MDGs. Liz Kubis and Ellen Meier are currently in Kumasi, working with the Ghanaian teachers to prepare for their lessons and providing trainings on IT and connectivity. 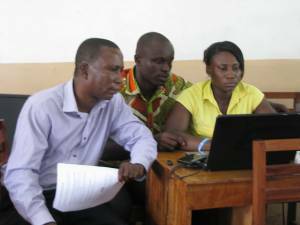 Kumasi schoolteachers prepare for the third year of the S2S Program. Kumasi schoolteachers collaborate during a recent S2S training. We are confident that this program will continue to have a significant impact on its participants, training the Kumasi teachers in particular in how best to select and apply online materials to enrich the content of lessons and discussions in their own classrooms and helping to foster innovative learning opportunities while bridging cultural, economic and geographic divides. We look forward, along with the students and teachers in some 20 Kumasi and New York science, math and technology classrooms, to what promises to be a successful and knowledge-filled school year!